Hosted by WestEd partner, California Community College Success Network (3CSN), the annual Reading Apprenticeship Conference will be held May 11–12 at the Kellogg West Conference Center and Hotel at Cal Poly Pomona. The conference brings together educators to share how they are using WestEd’s Reading Apprenticeship framework across disciplines and levels to create and support more equitable learning. WestEd’s Reading Apprenticeship framework helps students develop positive literacy identities, engage with challenging academic texts, and persist in their academic endeavors. Since 2008, faculty at more than 230 colleges in 25 states have experienced Reading Apprenticeship through small seminars, online courses, faculty inquiry groups, and communities of practice. 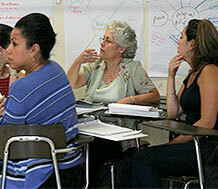 3CSN, an initiative of the California Community Colleges Chancellor’s Office, aims to develop leaders in California community colleges in support of increasing student achievement, retention, and equity across all campuses.